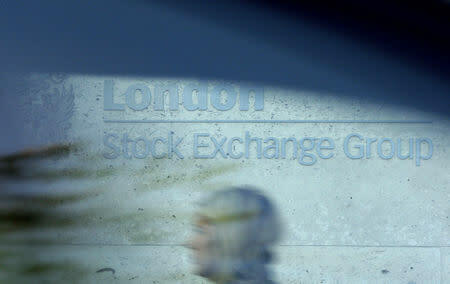 (Reuters) - UK shares lagged their euro-zone peers on Tuesday as growing risks of a disorderly Brexit rattled investors, while poor results from tour operator TUI and a profit warning from online trading platform Plus500 sapped appetite for stocks. The FTSE 100, which makes 70 percent of its income overseas, closed up 0.1 percent, after briefly falling into negative territory as sterling recouped some losses during May's speech. The currency hit a three-week low earlier in the day. Investors were tense ahead of Thursday, when parliament will debate Brexit with no date yet set for a further vote on May's deal. The domestically focused FTSE 250 ended down 0.1 percent as a plunge in Plus500 shares accounted for almost all the index's 31-point drop. "That the FTSE doesn’t need to make up the same kind of recent losses as its UK and U.S. peers likely has informed its Tuesday performance," said Spreadex analyst Connor Campbell. Dragging the FTSE 100 down was tour operator TUI, which has slumped since a profit warning last week, tumbling 7.5 percent to its lowest since July 2016 as its first-quarter loss widened. Housebuilders Barratt Development, Persimmon, Taylor Wimpey, and Berkeley fell 1.7 to 2.4 percent as investors shed stocks seen as vulnerable to a no-deal Brexit. "While this (refinancing) takes away the immediate pressure and provides a short respite, we believe Debenhams is likely to move forward with a CVA (credit valuation adjustment) in order to reduce its lease commitments and store numbers," said John Stevenson, retail analyst at Peel Hunt.